Police chief and local official drop flower petals from a helicopter on Kanwariyas, the pilgrims of Shiva. Traffic and security are in a mayhem as a result of acts of violence and hooliganism. Violence against Christians in Uttar Pradesh fill a list. New Delhi (AsiaNews) – Whilst acts of hooliganism and violence against Christians intensify in Uttar Pradesh, India’s “secular” authorities continue to show "preferences" for Hindus. Yesterday, senior police and government officials in Meerut (62 km north-east of Delhi), threw rose petals from a helicopter to greet Kanwar pilgrims. 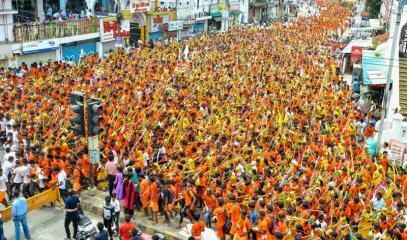 Kanwar Yatra is the annual pilgrimage of devotees of the Lord Shiva. 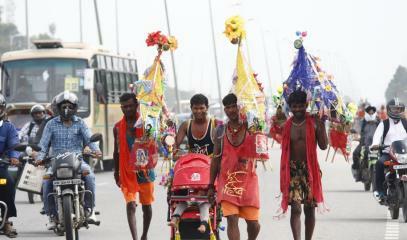 Pilgrims carry water from the Ganges River in pitchers, balanced between their shoulders at both ends of a stick. The pilgrims, called Kanwariyas, walk this way for hundreds of kilometres, barefoot. Prashant Kumar replied today to charges posted on social media of "favouritism" for throwing rose petals. "No religious angle should be given to this,” he said. “Flowers are used to welcome people. The administration respects all religions and actively takes part even in Gurupurab, Eid, Bakrid* or Jain festivals." Despite denials, police "favouritism" towards Hindu pilgrims is clearly evinced by their nonchalant attitude towards pilgrims’ hooliganism. Two days ago, in Moti Nagar, near Delhi, a group of Kanwariyas wrecked a car with sticks and iron bars because the car had tried to cross the road, swarming with pilgrims, inadvertently brushing against one of them. In reporting the incident, The Hindustan Times wrote that "confrontations and violence [. . .] are reported every year" during Kanwar Yatra, adding that the pilgrims’ "outlaw" style includes refusing to travel on designated lanes and, for those riding their motorbikes, to wear a helmet. "These incidents send worrying signals to minority communities in Uttar Pradesh where they live in a climate of fear. India is a secular country, which means equal treatment by the state for all religions. Unfortunately, such signs of preference for the ‘saffron’ people by the police and the administration, push Christians towards greater marginalisation." - 2 July: Hindu radicals attacked 150 Christians who had gathered to pray in a meeting hall in Raikashipur, a village in Pratapgarh district. More than 20 Christians were injured, some with broken limbs. - 9 July: Pastor Sabu Thomas, who was praying with a family in their home in Lucknow, was arrested on charges of forced conversion. He was released several hours later. - 15 July: Hindu radicals, along with police, broke up a prayer service in the village of Birne. Christians were ordered not to hold such meetings any more, nor conduct any activity without the permission of the authorities. - 19 July, a Christian pastor and his son were beaten for driving away a stray dog ​​from their church. * Gurupurab is a Sikh festival; Eid and Bakrid are Islamic celebrations; Jainism is an ancient Indian religion.